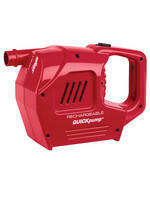 This dual action Coleman Rechargeable Quickpump can be used to inflate and deflate airbeds and other inflatables. The rechargeable system mean you can inflate your mattress anywhere in a matter of minutes. The nozzle fits all Coleman double lock valves, and it also includes attachments to fit Boston valves and pinch valves. Coleman® powerful pumps help to inflate and deflate your airbed quickly and easily. Several adapters allow you to use these high-volume pumps also for beach toys and other inflatables.